Here we go. My second annual rehashing of a Summer Travel Adventure. Last year took me to Italy and France. This Summer, two friends and I got the wacky idea to go to Iceland. Here is our story as well as I can remember it. Why must most/all fun adventures start in an airport? And with packing? Ugh, misery. But I got all of my things into one brand-new suitcase and most favorite mint-green hiking book bag (now complete with platypus mechanism). And so there were airports and overpriced airport food and then it was 10 AM and we were in Iceland. Weird. So, before going to Iceland I knew only shreds, niblets of information about the culture, the history, the geography, the anything of Iceland. I have mixed feelings (a pattern on this particular trip) about going about things in this way. On one hand - it was pretty awesome to have nearly everything be a surprise - on the other, I am so afraid that the more I learn after the trip, the more I will regret not absorbing everything while I was there. But I guess its a little late now. One of the most amazing surprises was the Nootka Lupin. Super beautiful purple flowers that are growing almost every where in Iceland. Coming from the airport there are huge purple hills of them. They were my first favorite thing. The rest of the ride into Reykjavik was fairly bleak. McKim and I both kind of wondered if perhaps all the amazing things we had heard was a giant hoax and this was like a double trick where it was called Iceland, but then their economy collapsed so they said it was green, but it actually was a barren wasteland. Damn you Erik the Red! 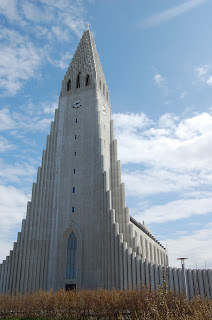 And then we were in Reykjavik. And it is Ahhhh-dorable. I know its supposed to be a big, important, capitol city. But more than anything, it reminded me of a city like Venice. Or, for all intents and purposes, Frederick, Maryland. It had a nice, walkable downtown area and then outer suburbs that you can largely ignore. 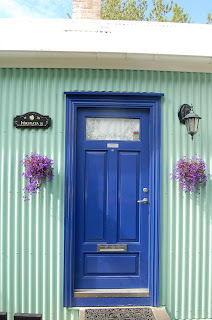 The houses in downtown Reykjavik are all wonderful colors! Many of the newer ones are made out of an unfortunate aluminum sheet business, but they made it better with all the colors. 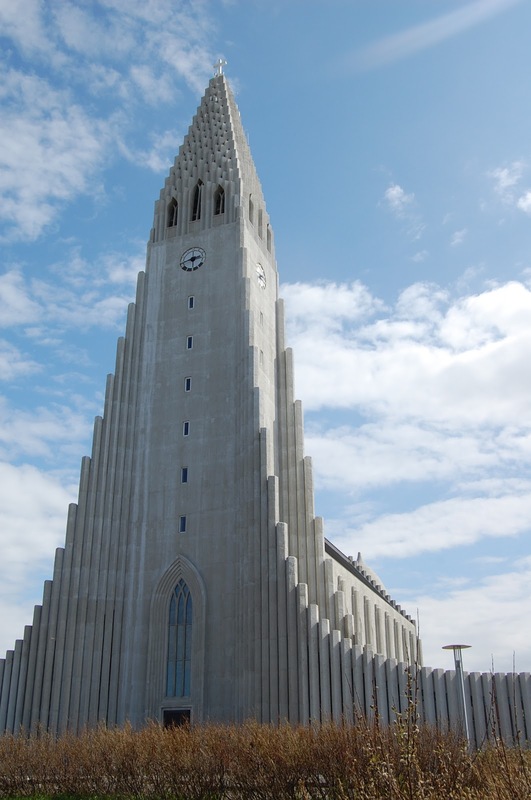 Our very first landmark, after the adorable and hospitable Hotel Floki, was Hallgrimskirkja which is the weirdest, most spectacular church I have ever seen. It was just two or three blocks from the Hotel Floki, and since it is the tallest thing for miiiiiles, it made it even easier to not get lost. And it was very pretty. The first meal was at the Cafe Loki. 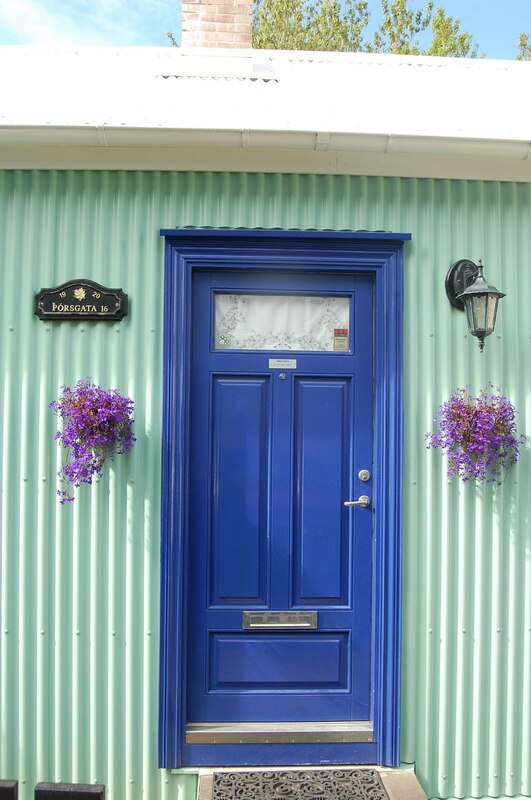 It had been recommended by the nice girl at the hotel for being very "traditional Iceland." Since I am your typical, skeptical, suspicious American, I assumed that meant it was like a Planet Hollywood (which I am sure some conseirge is selling as "traditional American.") but it turned out to be small, lovely, inexpensive (relatively) and really delicious. After lunch and some more exploring, we ended up at the 871 ±2 Museum. Basically, while digging a foundation for some new building they discovered the foundation of one of the first settlements in Iceland. They then figured out that the settlement was from the year 871-plus-or-minus-two-years. And so they just build up some walls around it, had some history major write some copy, and now they charge $15 to see it. So hilarious and awesome. We didn't pay to go in, already slightly horrified at how much everything cost, but we had fun peeking down at it, from the glass window that they put at street level. After the walking, it was time to eat again, so we made this choice. I went to Iceland really unsure about if I was going to try the whale. I had friends on both sides of the argument and then it just happened. And it wasn't until after it was all gone that I started to feel some feelings of uncertainty. So I read a lot about it while I was in the country, and then I felt more uncertainty and then I realized, that it doesn't matter because I had already digested it, the whale was gone long before I got there, and it was really (really) delicious. After whale and some over-priced shopping it was time to try out the geothermal baths. The hot pots were broken so we ended up just in the pool. It was fine. I wished we had tried another one before the Blue Lagoon. But we checked it off the list. Then we checked, super amazing delicious meal off the list by hitting up one of the newest, trendiest restaurants in Reykjavik (the name of which totally escapes me). It was amazing, and when we walked out at 11:30 PM we were greeted by our absurdly long shadows. The first mind warping midnight sun in Iceland.